The ET7-S2 enhance triode line-stage preamplifier has been designed to incorporate the advances made with the Series 2 upgrade to our flagship GAT into a more affordable model. The circuitry of the ET7-S2 follows closely that of the GAT Series 2. The audio circuit is elegant in its simplicity. An audio amplifier stage consisting of a single-ended triode amplifier provides the voltage gain. This amplifier stage is connected to the preamplifier outputs through a high-current MOSFET buffer, which achieves a very low output impedance, making the ET7-S2 extremely flexible in the choice of interconnect cables and amplifiers. DC voltage is supplied to the circuit by the revised discrete voltage regulator developed for the GAT Series 2. It isolates the audio circuit from the power line by maintaining negligible impedance across the audio frequency band. Infra-sonic noise is minimized by operating the tube filaments (heaters) on a dc voltage supplied by a separate regulated power supply. The ET7-S2 also boasts the GAT’s convenience and ease of use. The unit features input selection and level adjustment by microprocessor-controlled relays, with controls available both at the front panel and via a full-function remote. All control functions of the ET7-S2 operate through microprocessor-controlled relays. For the level control, the relays select combinations from a network of precision, low-noise metal foil resistors to effect loudness and balance changes in 100 steps of approximately .7dB per step. All switching and adjustment can be controlled by the unit’s remote control. A Theater Mode, which passes the input signal through at unity gain, makes it simple to incorporate the ET7-S2 into a high quality home theater system without compromising its two-channel performance. Like its bigger brother, the GAT Series 2, the ET7-S2 is constructed from the highest quality, carefully selected parts for unrivaled sonic performance and reliability. Tubes have been selected for minimum noise and microphonics. CJD Teflon capacitors are used in the ET7-S2 for output coupling and post-regulator power supply storage. In the power supplies, all capacitors are of polypropylene or Teflon—there are no electrolytic capacitors anywhere in the audio circuits or their DC power supplies. The resistors in these circuits (including the two dozen level control resistors) are special low inductance, high-precision laser-trimmed metal foil resistors. Switches are sealed relays with gold-plated silver contacts. Input and output connectors are machined from oxygen-free copper, and are gold plated. 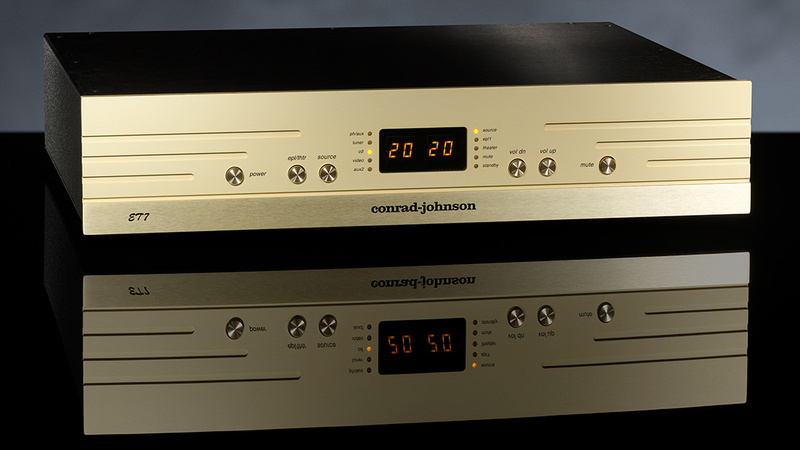 For four decades, the conrad-johnson design team has been dedicated to creating audio components that do credit to music performances. Through meticulous engineering, careful specification of only the finest available component parts, and a painstaking attention to construction, we have created what we feel is a line-stage without rival in its class. 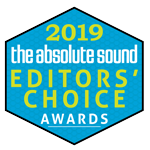 We invite you to arrange an audition of the ET7-S2 with your conrad-johnson dealer to experience the extraordinary musical performance of this remarkable preamplifier. 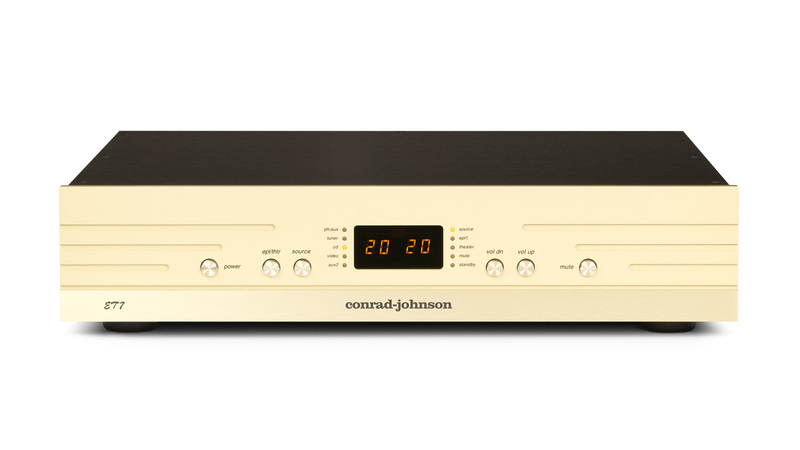 Every conrad-johnson ET7-S2 Line-Stage Preamplifier is patiently and carefully hand assembled, then individually inspected and its performance verified by an experienced audio technician.